Flames destroyed Christmas decorations on the deck and a Christmas tree on the roof along with a bicycle and what looked like several toys. Divers are now preparing to put some flotation devices on bottom of yacht to get it off floor of the bay so it can be towed. Two workers were on board when this fire began and so was the female owner, according to officials. The workers are believed to have helped pull the owner out of the burning yacht. Electric holiday lights strung along the yacht were left on overnight after Sunday’s Parade of Lights had ended, according to San Diego Fire-Rescue officials. Fire investigators will look into the possibility that those electric lights may have caused the fire. Investigators with the San Diego Metro Arson Strike Team will look over the vessel for evidence once it is towed to a South Bay boat yard. Once harbor police crews put out the fire, the yacht began listing greatly over to one side. 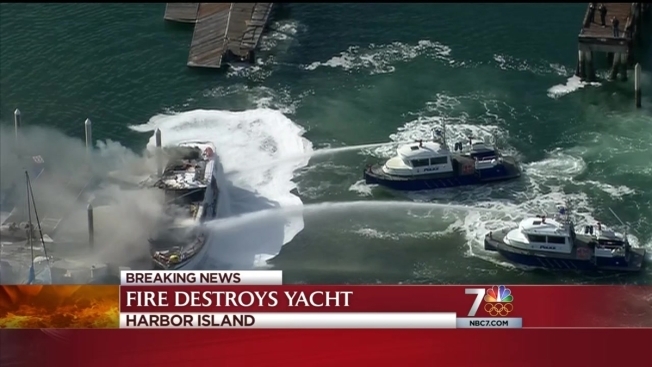 “That’s one of the problems and challenges of a boat fire,” San Diego Fire-Rescue spokesperson Maurice Luque said explaining how firefighters are careful how much water they use in these situations because too much water can cause sink a vessel. U.S. Coast Guard crews are investigating possible contaminants that may have been released from the fire into the water. The 1,500 gallons of diesel still in the yacht’s tanks is of great concern. Officials said a vessel salvage company will come in and surround the yacht with buoys and tow it out of the marina to avoid any environmental concerns over the boat and its fuel sinking in the bay. The Sea Siesta was a 57-foot wood and fiberglass boat available for charter as a bed and breakfast. There are more than 100 boats docked in the marina along Harbor Island Drive just west of downtown and south of Lindbergh Field. No other vessels were damaged. Forty firefighters and 20 Harbor Police officers responded to the fire. The Parade of Lights is an annual event where dozens of decorated boats parade on the harbor and along the Embarcadero.